Neil Armstrong's private world drives the biopic First Man. Ryan Gosling is a handsome man, but it's his profile that's most aesthetically pleasing. We saw a lot of it inDrive, where he sat behind the wheel of a car and was often photographed from the passenger seat, and we see it again inFirst Man, where he's a test pilot in a cockpit. Gosling's pilot, like his driver, is a man of few words who keeps his emotions under wraps. But unlike the driver, the pilot has a name: Neil Armstrong. First Man—which reunites Gosling withLa La Landdirector Damien Chazelle—is a biography of Armstrong covering the decade-long journey that ended with him on the moon (well, that ended with him comingbackfrom the moon). Adapted by Josh Singer (Spotlight) from James R. Hansen's book, the film handles the biopic tropes with better-than-average success, shedding light on a man who was a household name, but whose private nature made him an enigma to the public. 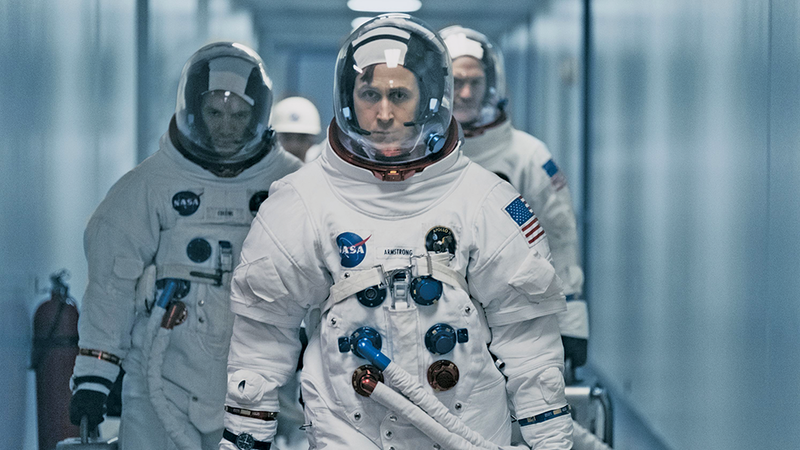 It runs long, with restlessness setting in during the midsection, but Chazelle handles the climactic moon landing itself with breathless, meticulous cinematic skill. Armstrong, his wife, Janet (Claire Foy) and their little boy move to Houston, having already lost a daughter to cancer; Armstrong's new co-worker Ed White (Jason Clarke) lives across the street with his wife, Pat (Olivia Hamilton). The wives bond over the stress of being married to astronauts; Armstrong and White would describe themselves as friends, but Armstrong never talks to White—or anyone—about his feelings, particularly about the death of his daughter, which affected him deeply. Years pass quickly in movie terms, as Chazelle hits the highlights of the Gemini missions and Armstrong's role in them. He emerges as a thoughtful scientist with steel nerves, saving his own life or the lives of others on more than one exciting occasion. But there are tragedies he cannot prevent, as space-exploration buffs no doubt recall. As time passes and casualties mount—and America is mired ever deeper in Vietnam and other societal unrest—people start to ask: Is going to the moon worth all the money and lives it's costing? The answer can only be yes, right? Chazelle doesn't really make a strong case for it, other than presenting the culmination of the mission with reverent awe, but if it was all a boondoggle, then this story is depressing and ironic, not inspiring. But it seems a misstep to raise the "Is it worth it?" question, then act like it's rhetorical. Like most of the missions it depicts, the film is technically top-notch, Linus Sandgren's cinematography and Justin Hurwitz' sweeping musical score leading the way. Also like the missions, the movie drags in the middle as a sense of repetition creeps in. You wouldn't initially think of it as an effects-heavy film, but the sequences set in space and on the moon are uncannily convincing, even better than the ones Stanley Kubrick faked 49 years ago (kidding). The supporting cast is full of familiar faces like Kyle Chandler, Ciarán Hinds, Patrick Fugit, Lukas Haas, Shea Whigham, Ethan Embry and Corey Stoll. The latter plays Buzz Aldrin, who was a bit of a jerk, or at least comes off that way when the movie is about Armstrong. Biopics about people who were stoic and inscrutable are risky, as there often isn't enough available information about them to flesh out a movie protagonist.First Manand Gosling's performance avoid that problem by giving Armstrong an arc that, accurate or not, provides satisfying resolution to his character. Scenes of people around the world celebrating what America has achieved on behalf of all mankind—minus the Soviets; this was to spite them, not help them—are a reminder that for all our manmade divisions and quarrels, we are one world that reached out and touched another one. And that's pretty awesome.